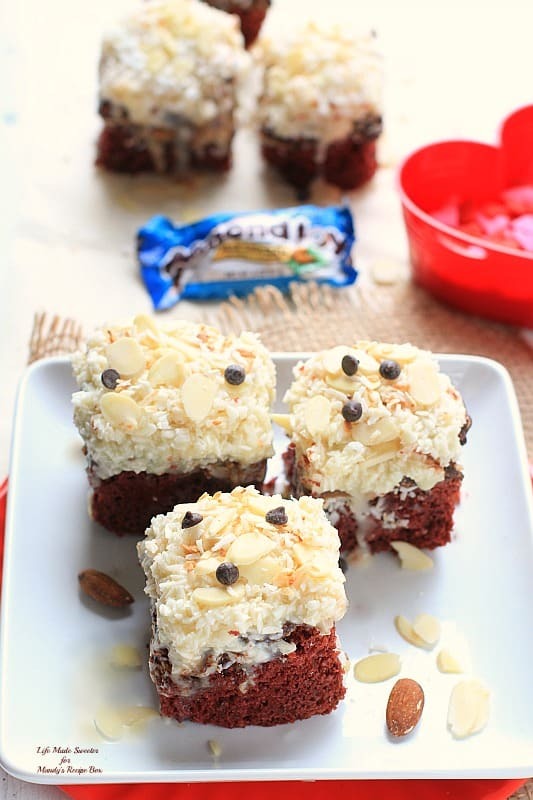 Red Velvet Almond Joy Gooey Cake Bars has the best flavors of your favorite Almond Joy Candy Bar in these easy red velvet cake bars. I am a sucker for anything with coconut and almonds so I decided to add the classic Almond Joy candy bar flavors to a simple red velvet cake. The results were these totally decadent and indulgent bars. They start with your favorite red velvet cake mix that you whip up with a few simple ingredients. The soft dough is layered with shredded coconut and sweet chocolate chips. A mixture of shredded coconut, almond slivers and sweetened condensed milk tops off the cooled bars. 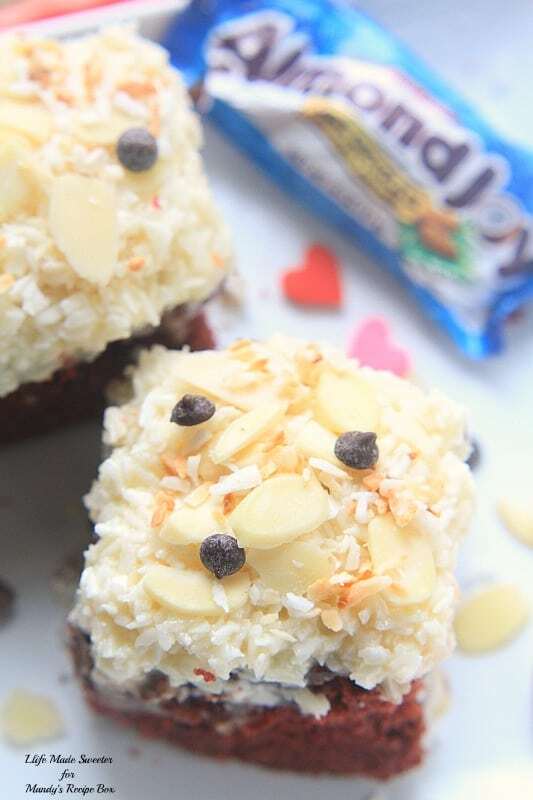 Sprinkle with almond slices, chocolate chips and toasted coconut. 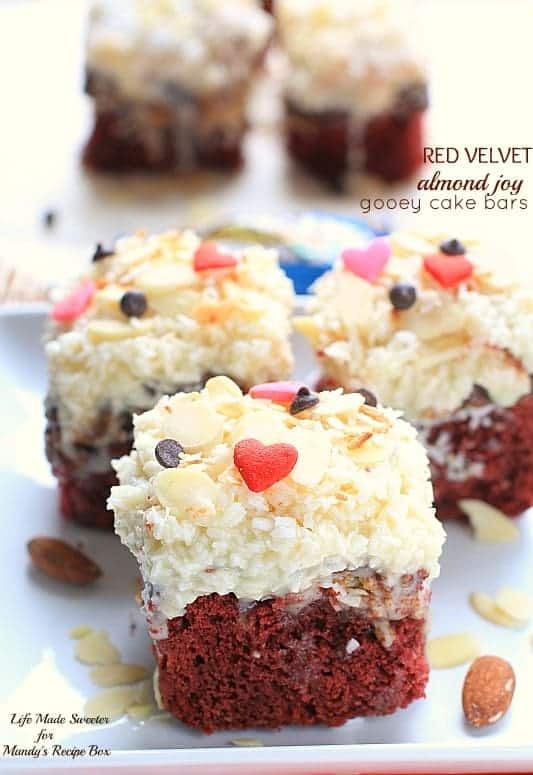 Red Velvet meets Almond Joy in gooey cake bars makes these the ultimate decadent treat for Valentine’s Day! Red velvet cake mix bars topped with melted chocolate, a thick layer of sweet gooey coconut and sliced almonds make these the ultimate decadent treat. In a mixing bowl, beat the cake mix, softened butter, egg and vanilla extract until a soft dough forms. Press the dough into prepared pan. The dough will be sticky so it will help to use an angled spatula to spread evenly and flat. Sprinkle the top with 1/2 cup of shredded coconut and chocolate chips. Bake for 27-30 minutes or until the top is completely baked. Allow to cool completely before frosting and cutting. Meanwhile, mix together the remaining 2 cups of coconut, almond slivers and sweetened condensed milk. Spread evenly over cooled bars. Top with almond slices, toasted coconut and chocolate chips. Place in the fridge to allow coconut layer to set for at least 30 minutes. Lift cake out of pan using the overhang and slice into bars. Garnish with sprinkles if desired. Makes around 16 squares.